As visitor lead for the redevelopment project, my role was to create a vision for the museum in order to broaden and increase visitor numbers and engagement. This meant consulting with the public and stakeholders about their experiences of the old museum to find out what they felt should be delivered by a new national museum about the Army, and to deliver these needs through the project. This encompassed rebranding, briefing the interior designers of the new museum to ensure that it was a welcoming place where sometimes difficult content could be communicated and discussed, delivering the new galleries, learning and public programmes, and marketing and promoting the new museum. What were your ambitions for the recent redesign? 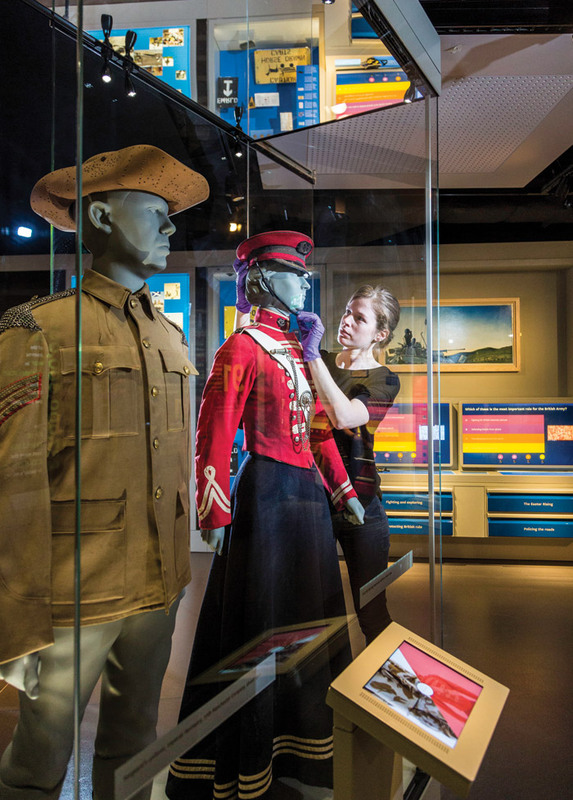 We wanted to create a modern, 21st-century museum about the British Army, and at the same time provide a social space that was welcoming and pleasant to visit. 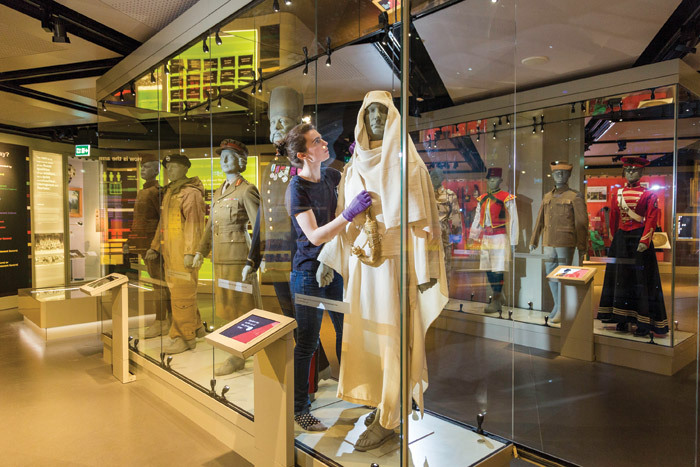 During design development we further detailed the architect’s brief to ensure they understood that we wanted to create a museum that celebrated the Army and gave recognition to service and to those who serve, as opposed to being a museum about conflict. This led to a fundamental review and overhaul on the design of the space to create the museum you see today. It also accounts for why we don’t have any weaponry or large equipment in front of the museum or in the atrium. We are a museum about the British Army, not war. Our role is to connect the British people to the Army that serves it. Underpinning this we wanted people to understand why medals have significance to the Army and soldiers (and within society). Medals represent service, commitment and sacrifice and tell a story of the campaigns they commemorate. We didn’t want to overly focus on sacrifice. Instead, we wanted to very simply signpost that medals carry meaning and denote service (that could be explored at whatever level audiences want) and to celebrate and give thanks for this service. 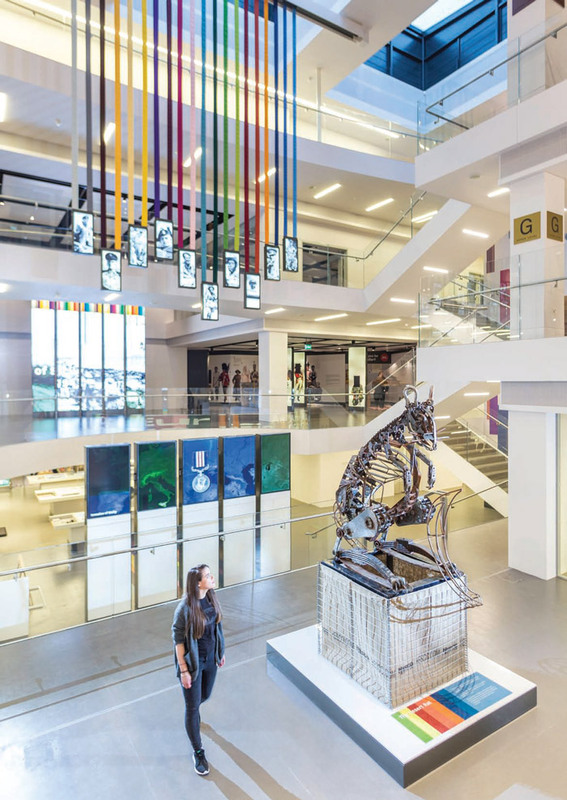 The colourful medal ribbons in the central atrium signal the celebration of service and the audiovisual display explains the significance of medals so that they can be better understood by visitors. Many of us have our grandfathers’ and great grandfathers’ medals at home. These both tell us the story of their lives and service, and link many of us to the British Army and the past to give it new meaning and relevance to today. Why was the project necessary? At peak times the old museum’s facilities – toilets, cafe, shop, exhibitions – were overcrowded. The museum lacked dedicated learning facilities. Collections storage facilities did not comply with modern standards and the galleries were showing their age. Did you look at any other cultural buildings for inspiration as part of your research for the redesign? Absolutely. In terms of the visitor offer, we visited many sites to look at what had been achieved through other museum and building redevelopments. In particular, we looked at the Imperial War Museum, Ulster Museum, the Ashmolean Museum and the Wellcome Collection. We also visited the Netherlands National Military Museum in Soesterberg and the Bundeswehr Museum of Military History in Dresden. What do you think is key to creating a successful museum experience? That’s really simple – designing an experience for your target visitors. The issue is that, all too often, museums don’t place visitor needs at the centre of decision making and instead prioritise the collection or the standing of the museum. If you think about museums and collections being at service to the public, this can help shift the prioritisation and decision-making process. How did you chose the architects and designers you worked with? We worked with BDP and exhibition designer Event Communications from master planning through to delivery. We did at the end of RIBA Stage D re-tender the exhibition design to enable us to have greater influence over the exhibition design rather than have this as a sub-contract under BDP. We also worked very closely with Premm Design and ABG Design that helped guide and champion the brand into the architectural and exhibition design scheme from RIBA Stage D onwards. So it was a real team and joint effort. All works were publicly tendered. What qualities do you generally look for in your design team? We’re always seeking design team members who can take on and champion our vision and stretch it further. But we also want a team that can collaborate and work creatively with the client and each other to achieve the best possible outcomes. That’s the ideal. Are you pleased at how the redesign turned out? We love it. This was a challenging project with lots of learning and responsiveness needed along the way. It has been wonderful to be part of the way the entire museum and design team have pulled together to create and deliver the new brand and vision for the museum. The feedback from our peers and visitors is a testament to its success. What works particularly well is the central atrium. It delivers fully on the brief for the visitor experience to be easy to navigate, for the galleries to be visible, and to not be too noisy. Moreover, it creates a space that is open, welcoming, calming and pleasant to be in. We know this because that’s what our visitors tell us. And this is a real success story because we know that the public can find our story difficult to engage with. So designing a space that makes this easier to achieve was fundamental in enabling the museum to deliver its purpose. Did you enjoy the collaborative experience with the design team? Very much so. Overall, the design team worked closely and positively with us. As with all projects there were challenging discussions and decisions to be made along the way, particularly with regards to budget. 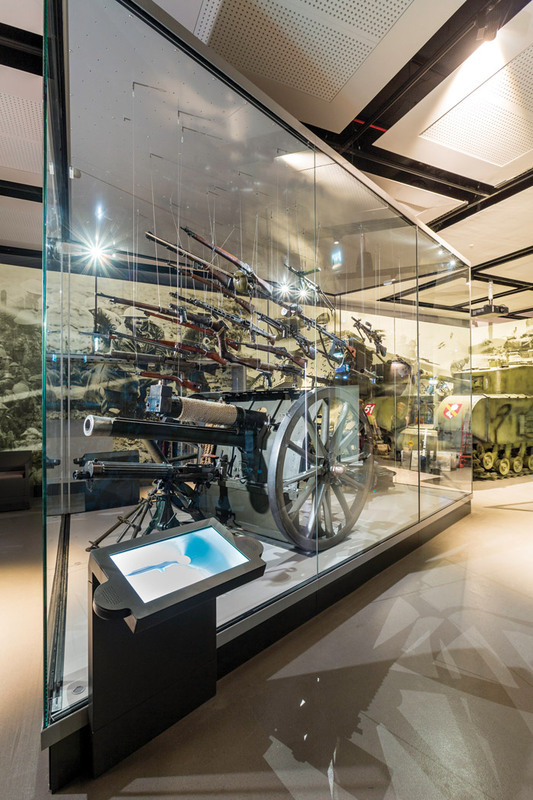 But ultimately, all design-team members really understood what we were trying to achieve in rethinking what an Armed Forces museum could look and feel like, and what it can offer the public. It has been a hugely positive and enjoyable experience. Aside from the major redesign, how many different design projects do you generally commission in a year? What sort of projects are these? We procure design work throughout the year and are doing a lot of work at present as we roll out the new brand. Our main design commission each year is our temporary exhibitions work. What is the most challenging part of your job as a design client? At present the two key challenges are generally keeping to budget and ensuring designers deliver to the brief and the new brand. What’s been really interesting is that when we commission design, we often receive responses that use traditional images of the Army, such as Trooping the Colour and other formal ceremonies. Our new brand values of real, relevant, stimulating, insightful, conversational and sharing require a very different approach. What is the most rewarding part of your job as a design client? Seeing an organisation’s business needs being delivered through great design and being able to engage with audiences through new approaches to visual communications. Working creatively with designers to achieve this is one of the most exciting and rewarding parts of my day-to-day job. What future design projects are in the pipeline? We’re already working with MET Studio on our 2018 temporary exhibition. Later this year, we’ll be tendering for our 2019 exhibition.